There are two different ways of accessing this very popular walk. For ease of parking, turn off Eagle Heights Road into Dapsang Drive at the “St George Anglican Church”, there is a large parking area to the left at the end of the street. Alternatively, you can also access the start of this walk via a 400meter long track starting at “Tall Trees” T-junction of Eagle Heights Road and Geissmann Drive. This is a popular tourist stop with several cafes and eateries, so parking is limited at times. Curtis Falls (D5) 1.5km return, 106 stairs, moderate grade with some steeper sections, allow 60 minutes return with plenty of time to admire the waterfall. The track begins in wet eucalypt forest beneath towering flooded gums. You will notice a drop in temperature as this turns into lush rainforest. Look out for beautiful crows nests and staghorn ferns growing in the canopy above. The track gradually descends to Cedar Creek, which is reached after the last set of steps. Turn left to reach beautiful Curtis Falls, only a short stroll away. The falls run all year-round, however, they are at their most spectacular after heavy rainfalls. The track ends at a viewing platform overlooking a large rock pool, with great views of the falls and the surrounding columnar basalt rock face. Please note that swimming is prohibited at the falls, there is a restricted access area below Curtis Falls protecting a fragile glow-worm colony. Instead of heading back up again coming back from Curtis Falls, you can follow the piccabeen palm-fringed creek which starts at Curtis Falls to the start of the circuit, passing several smaller cascades. Start the circuit walking left; you will soon cross Cedar Creek. The rainforest trees are laden with elk horns, stag horns and birds nest ferns. 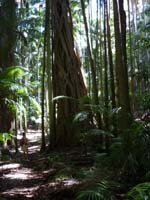 The track passes a large clearing which was created by a fallen giant strangler fig. Eventually, an easy “hop-over boulder” crosses the creek and the track turns right back towards Curtis Falls. Past the boulder creek crossing, the track to the left is closed and becomes impassible after a short while, as it is no longer used. Please keep out, the track is no longer safe to use, with rockslides and slippery surfaces. 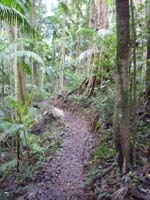 This section of the park is easily reached via Tamborine Mountain Road. Heading up the mountain from Tamborine Village the turn-off to “Cedar Creek Falls Road” is just past the information map stopping bay on the left, on the same sharp right bend than the turn-off to “Thunderbird Park”. This flat track from the car park to the lookout is suitable for strollers and assisted wheelchair access. The lookout at the end of the walk offers very nice views of the waterfalls, cascades and a series of rock pools popular with swimmers. Car parking is limited during busy periods. 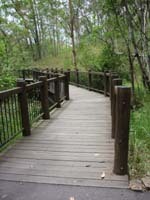 This track provides access to Cedar Creek and some of its spectacular cascades, waterfalls and rock pools. Walkers descend down through open forest and dry rainforest and arrive at these popular swimming holes after crossing extensive jumbled rock scree slopes just before the creek. In North Tamborine, turn off “Main Western Road” into “Main Street”, continue past the shops and the residential area where it becomes “Knoll Road”, keep left when the road forks. The track descends from the car park to the creek level through transitional rainforest with large flooded gums and Piccabeen groves. 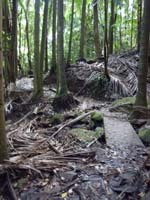 Often large black skink lizards can be seen sunning themselves on this track. Turn right when reaching the Sandy Creek circuit, and follow the gently sloping track until the track turns sharply left, continuing along the cliff edge. You will soon reach the top of Cameron Falls via a concrete bridge crossing Sandy Creek, offering spectacular views to Mount Flinders and Brisbane. A branch track to Cameron Falls Lookout just past the bridge enables you to truly appreciate the natural beauty of this waterfall. Complete the circuit by continuing right when returning from the branch track, crossing Sandy Creek shortly before reaching the uphill track back to the car parking area. The start of the walking trail is easily accessible on “Main Western Road”. Plenty of parking and great inland views make for a pleasant start of the walk. The southern start of the track descends down the steep mountain side through open forest, allowing great views. It flattens out and continues through a stretch of seasonal lagoons, a wet-weather deviation track guarantees easy navigation all year round. “Witches Falls” are reached just past the northern return track T-junction. Another 50 meters will get you onto the viewing platform, offering great inland views as well as letting you admire the “Witches Falls” waterfall. Return via the northern exit track zigzagging up the mountain through dense rainforest. NOTE: Due to heavy rain early Feb 2010, the southern track is currently closed for repairs. Click HERE for further information. This walk also starts at “Main Western Road”. It descends down the mountain using the northern track to the “Witches Falls” waterfall and lookout, and continues along the cliff through rainforest, passing a huge boulder field making for a slightly more challenging terrain towards Beacon Road. Once you passed the boulder field either turn around and head back, or keep following the track until you reach the car park at the end of “Witches Chase”. From here, the Witches Falls car park is 3 km along Beacon and Main Western Roads. For ease of parking, use either “Palm Grove Road” or “Curtis Falls Road”. Alternatively, this walking area can be reached by using an access track starting at the corner of Eagle Heights Road and Palm Grove Road. Access via Curtis Road is recommended, as the access track itself offers many rewards to walkers such as giant strangler figs and amazing root formations. The track zigzags down the mountain before it flattens out to reach the beginning of the circuit. Pass peaceful palm groves and some fascinating fungi on the way. Incorporating parts of the “Palm Grove Circuit”, this circuit leads into drier eucalyptus forest. Hoop pines, brush box and grey guns abound and walkers will pass through a grove of ancient cycads. Watch for steep cliff edges and remain on the track at all times. Jenyns Falls are seasonal, with very little to no flow recorded in some of the drier winter months. Turn into “Wongawallen Road” at the upper roundabout of “Gallery Walk”, parking is about 200 meters down the road on the left opposite the “Heritage Centre”. 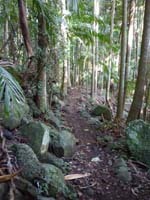 This relatively flat loop track passes through rainforest with towering strangler figs, beautiful piccabeen palm groves and tall trees with vines and ferns. This precious track of subtropical rainforest is popular with bird watchers, and offers visitors a quiet rainforest walk away from street noise and crowds. The circuit is easy to navigate and very enjoyable.